Heartland Outfitters is located in west central Illinois and manages hunting ground in Adams and Brown counties. We also have leased hunting ground in other Illinois counties. The Bush camp lodge was completed in 1998 and provides accommodations for up to sixteen guests. The basement level opens onto a lakeside patio and dock built on a six acre lake with excellent fishing and swimming. The lake is well stocked with bass, bluegill, crappie and channel catfish. Boats have electric trolling motors and live wells. An elevated lakeside party house has a small kitchen and screened meeting area to enjoy sunsets on the water with friends and family, over dinner and drinks. Guests can enjoy 3-D archery, hiking and horseback riding on trails through Heartland property and into Siloam Springs State Park which adjoins our Cook Farm. The Bush camp is adjacent to the Wildwood Girl Scout camp, the Buckhorn Ranch, and Siloam Springs State Park which total over 10,000 acres. These areas are either not hunted or quality managed by the State of Illinois. The Heartland Outfitters Bush, Cook, and Gladwell farms include more than 2200 contiguous acres also quality managed for large deer, creating a total of over 12,000 acres with large mature whitetail bucks and hundreds of wild turkeys. The genetics of this area produce bucks with exceptional mass, often with abnormal points as featured in Rack Magazine articles (www.rackmag.com). Nearby golf courses include Arrow Head heights in Camp Point, Westview in Quincy, and Rolling Greens in Mt. Sterling. 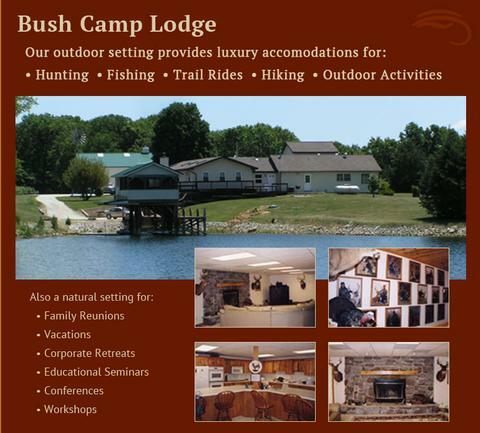 The Bush camp is an excellent choice for a family vacation or reunion, a corporate retreat, or a hunting adventure. From Springfield: From the East on either Hwy 72 from Indianapolis or Hwy 55 from Chicago, follow into Springfield, Illinois. Take Hwy 36 (West) toward Jacksonville. Pass Jacksonville and take the Bluffs exit, (Hwy 100), turn right and follow signs to Hwy 104 (Meredosia). Follow Hwy 104 through Meredosia and cross the Illinois River Bridge. From the bridge, follow Hwy 104 (West) straight for 9.8 miles to Hwy 107 (flashing red light). Turn right (North). Go 8.4 miles to road 525 N (small green sign) and turn left (West). Go 2.9 miles to “T” in road and turn right. Go 3.1 miles and turn left at the junction of 575N and 200E (South). Go 1.7 miles and turn left at 400N (black mail box). Go approximately 0.6 miles, turn right and follow the lane up to the house. It is approximately one mile from the turn on 400N to the house. From St. Louis Airport: Take Hwy 70 West to exit #210B/Wentzville/Hannibal. Exit onto US61 north to Bowling Green (North). Take US 54 to Louisiana, MO (East). Cross the Mississippi River, continue on 54 to Pittsfield, IL to Illinois 107 (North). Proceed to the junction of Hwy 104. From the junction of 104, go straight for 8.4 miles to Road 525 N (small green sign) and turn left (West). The allocation of nonresident archery and firearm deer permits continues to evolve as more hunters apply to hunt whitetail deer in Illinois. Heartland Outfitters does everything possible to assist our clients in obtaining permits. Several ago, the number of out of state archery permits available was capped at 12,500 and hunters were required to call the Bass Pro Shop in Springfield, Missouri, to apply for a permit. Beginning with the 2008 season, the Illinois DNR raised the out of state quota to 25,000 and the price of these permits has increased as well. Bass Pro Shops will no longer be involved in processing archery deer permits. Heartland Outfitters will send each of you an archery or firearm permit application, which must be returned to us two weeks in advance of the DNR deadline. We will hand deliver your application to the DNR here in Springfield. We have always assisted our hunters in obtaining permits and have never had a problem. Hopefully, this year will not be any different if we receive everyone’s permit applications on time. Heartland Outfitters will also assist hunters in obtaining a wild turkey permit. Illinois has five seasons within a one month period from mid April to mid May. Hunters must specify the season and the county desired along with other personal information on the permit application. Permits are allocated on a first come, first serve basis, and must be submitted in December of the prior year. We will assist all hunters in obtaining permit applications and will submit them to the DNR.